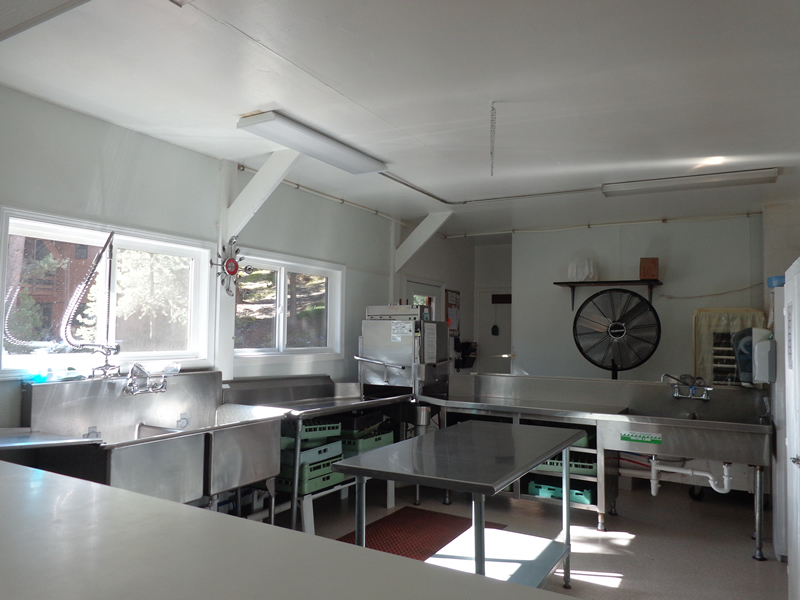 The kitchen facilities are located in Hawley lodge on the west side and can be accessed from the main lodge room, or one of two kitchen doors located on the north and south side. The kitchen is divided into 3 areas, a food prep area, a cooking area and a clean up area. There is a large commercial gas stove with 4 burners, 2 ovens and a griddle. The overhead vent is equipped with an emergency fire suppression system. There is also a convection oven, a commercial mixer, food processor, commercial size pots & pans, cooking utensils, baking pans and serving containers. Dinnerware provided consists of plastic plates, cups, bowls, glasses and silverware for 100 people. There are 3 sink areas. A double sink for food preparation only, a single hand washing sink and a large double sink for clean up. Adjacent to the clean up sink is a commercial dish sterilizer and an area for air drying dishes. The kitchen has a large pantry, walk-in refrigerator and freezer. There is a large pass thru window and two doors from the kitchen to the main lodge. For convenient grilling exit the north door to the shaded patio area. A telephone is located in the kitchen. Copyright © 1932-2019 Camp Sawtooth. All Rights Reserved.